Due to its distinct lack of physical controls, setting sound levels on Apple's new AirPods requires the use of either Siri or the volume buttons on a paired iPhone, both of which operate on preset magnitudes. For greater control, use Siri to raise or lower the beats by percentage. As iPhone and iPad owners know, Apple maps specific output levels to its physical volume controls, in some ways mimicking a stepped attenuator. While not as smooth as a potentiometer style knob, the presets are good enough to home in on a desired loudness level. Changing volume on AirPods via Siri works in a similar fashion, but instead of buttons users tell the virtual assistant to "lower volume" or "turn up the volume" with their voice. The process feels vague in comparison to the physical controls on iPhone, perhaps in part due to the lack instant onscreen GUI feedback. Further confusing matters, iPhone's volume controls raise and lower output in 6 percent chunks, while Siri makes changes of 12 to 13 percent when performing the same operation. The method avoids repeated commands, but makes it difficult to arrive on a specific volume. For those who want greater control over their AirPods, even more so than iPhone's volume buttons, Siri lets users set audio output volumes by percentage. First, invoke Siri with a double tap on an AirPod, or the "Hey Siri" feature, and say, "Set volume at 53 percent" or "lower volume to 23 percent." Apple's virtual assistant is capable of understanding a number of command variations including "raise/lower volume," "turn sound up/down," and "increase/decrease volume," among others. Next, add a percentage —from 0 to 100 percent —onto the back of volume control commands. Granular changes within two percentage points are hardly noticeable, but tweaks above three points are surprisingly distinct. It should be noted that telling Siri to "increase/decrease volume" will land users at the nearest default level —0, 13, 25, 38, 50, 63, 75, 88 and 100 percent. 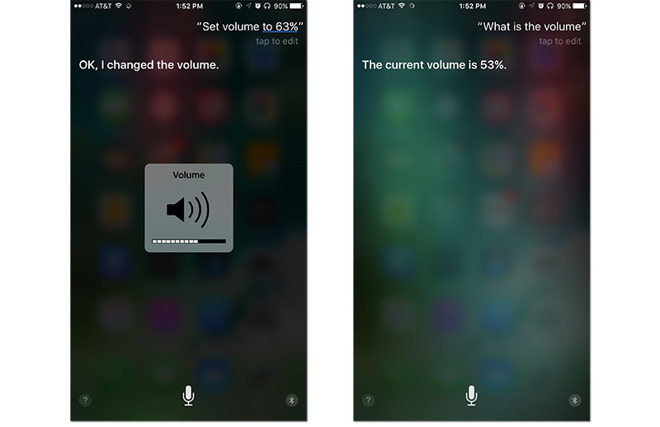 To discover current listening levels, users can ask Siri, "What percent is the volume?" or "what is the volume?" It might take a bit of experimentation and testing using the "what is the volume" feature, but defining volume by specific percentages instead of using Siri's rather clunky default settings will likely be worth the trouble for picky listeners. Stay tuned to AppleInsider for more AirPods tips and tricks.